As winter weather begins to make its way across BC, impacting our driving conditions with snow, ice, rain, fog, etc., it’s always best to be prepared with a safety plan. And those plans are ready for winter. So keeping that in mind, and regardless of the size of your trucking company, it’s important to establish an effective safety program. Make sure your organization has policies, procedures and practices in place for everything from winter-specific trip inspections to driver education and supervision, emergency planning and more. Adjust scheduling during winter months to allow drivers adequate time to arrive. Know when and how to safely and properly install chains or other approved traction devices in compliance with the Motor Vehicle Act. Know the chain-up/pull-out locations and fuel stops for your drivers’ routes. Adjust speed and driving behaviour to adapt to changing road and weather conditions. Warm, water-resistant clothing (including head and ear coverings), winter boots, multiple pairs of gloves. Safely secured winter equipment, including flashlights, emergency food and water and air break antifreeze. *LOTS more suggestions are available in the Shift into Winter safety plan document. 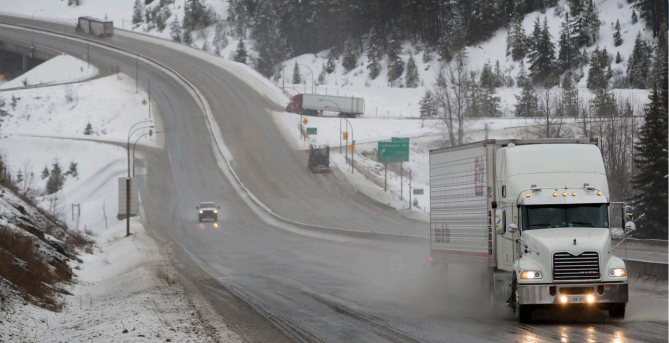 Another good reminder for commercial carrier employers: establish a joint health and safety committee as set out in the Workers Compensation Act and make sure they are involved in all aspects of winter driving safety. For more information, visit the Shift into Winter webpage on employer and supervisor tools to keep workers safe; follow @DriveBC and visit the DriveBC website for webcams and current weather conditions; read the National Safety Code for duties of carriers and operators and go to worksafebc.com for info about the Workers Compensation Act. reduction of speed limits are an excellent modification of regulations. Thanks for your feedback Douglas – we appreciate hearing it!